Chris Scarlett was a passionate left-handed disc golfer with a contagious smile, captivating sayings, and dance moves like no other. 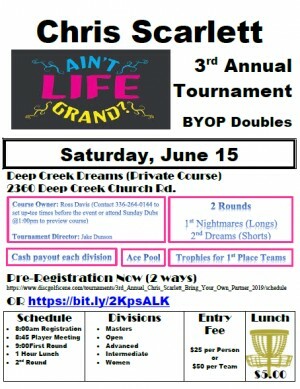 To honor Chris and his love of disc golf we host this "disc slinging, chain banging, smile bringing" event. Deep Creek Dreams (Alison Scarlett) is responsible for all refunds/cancellations. JERSEY MIKE'S Subs served with sides, drink, and dessert.